Becoming a parent means a new family member and new sense of self. 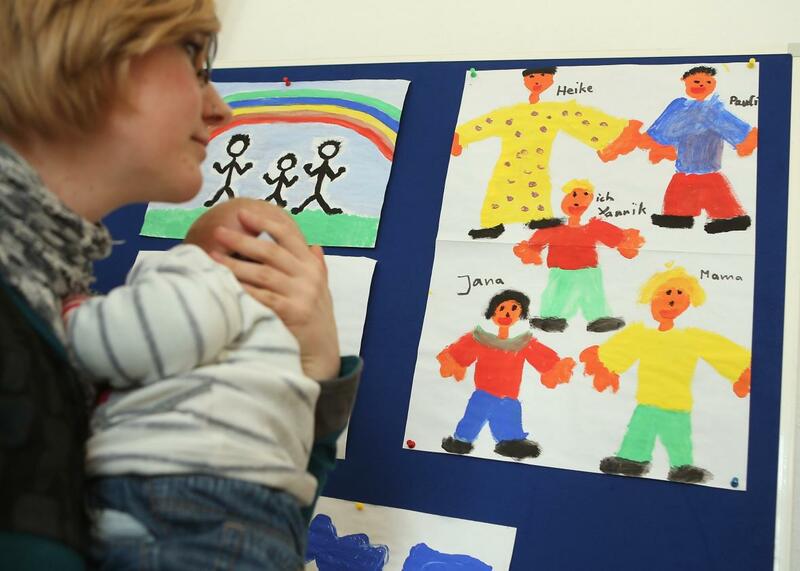 Isabelle Materna, who is lesbian, and her three-month-old son Arved attend the opening of Germany’s first gay parent counseling center on March 15, 2013 in Berlin, Germany. Hey, Daddy! is a monthly column exploring the joys and struggles of parenting from a gay father’s perspective. Got a topic idea or question for Daddy? Send your letter along to johnculhane19104@gmail.com. A few months ago, I had a conversation with a neighbor who was about to send his son to a ludicrously expensive private high school. The tuition would be out of reach but for the generosity of my neighbor’s own father—now elderly, with plenty of money. My neighbor then volunteered that his dad saw sending his grandson to private school “as an investment in his gene pool.” For a moment, he’d forgotten that he was talking to someone who is an adoptive parent (with kids in public school, too). When I reminded him of our family situation, he mumbled something about how the whole “gene” reference was a “shorthand” for wanting to pass something along to the next generation—it wasn’t really about biology. But I don’t think he meant it. I thought about this exchange as I was reviewing the many thoughtful comments and long emails that last month’s Hey, Daddy! column on the adoption/surrogacy choice generated. I’ve rarely been met with such deep and respectful engagement, both with me and with fellow commenters. As I read and considered the feedback, I realized how constitutive of identity these decisions about family formation become. How do we define ourselves, and what part of that definition is a consequence of how we become parents, and choose to parent? How much of my identity is reflected back at me through my children’s actions and interests? And is the importance of reflected identity part of why so many people still value biological parenthood over alternatives? The conversation with my neighbor illustrates that, for some, the biological/genetic connection is paramount. One of the folks who wrote me was a woman who had adopted several Indian children said that her father worried about the “wild card” genetic element of creating a family this way. (“You don’t know what you’re getting!” he blurted out.) You never do, of course. As the writer Andrew Solomon has memorably stated, “[t]here’s no such thing as reproduction.” But many find comfort in the thought that their essence will be stamped on their offspring, despite the abundant evidence to the contrary. For those who adopt, the issue of identity can lie barely submerged, bobbing to the surface when we’re asked to think about our connection to our kids. One email from a woman whose adopted child is now grown was candid about how her daughter differed from her and her husband: “It … is much harder than you realize to live with children who are completely different than you,” begins one paragraph. Then, after describing herself as “bookish” and “’proper’” and her husband as from an “aggressive, talkative Jewish family,” she revealed that her daughter “doesn’t like reading” and “is very rough and tumble, loves animals and sports.” Looking at a child so different from herself seemed to have been jarring, perhaps because she didn’t see herself reflected back through her daughter’s way of experiencing the world. Was any of the perceived difference because her daughter is African-American and the couple is white? She didn’t say, but certainly race is a vital, and fraught, part of everyone’s identity. And, not knowing that my own children are white, she did advise me to make efforts to include in my social circle people who “look like them.” Yet her reaction to her daughter’s differences was also instructive—after all, why didn’t this woman love animals? —and seems to have led her to insights, and evolution. Our identities aren’t static, after all, so having a child jarringly different from ourselves can be a big part of our on-going project of self-(re)definition. It’s not just the parents whose identities are forged and challenged through our family choices. What about the children who come into families through adoption, surrogacy, or sperm donation? How do they create and understand their own identities? Some adopted children really want to know about their bio parents, or even about the circumstances of their infancy, where possible. I was struck by the account of the woman whose adopted Indian children—who had no chance to learn about whom their parents were—were powerfully affected when they visited the orphanage they’d all come from. Others don’t seem to care. The same is true of families formed by surrogacy or gamete donation. We’re a long way from understanding what drives identity and connection in individual cases. But certainly children become no less invested in the question than their parents. Often, of course, the decision on how to form one’s family is driven by practical concerns, as the many responses to the previous article revealed. Adoptions can be challenging and expensive, creating families through foster care is emotionally risky and uncertain, and surrogacy carries its own complex battery of legal and emotional complexities for all involved. In many cases, people make their choices for those reasons rather than because of any deeper considerations. At the most basic level of human experience, the fact of becoming a parent or a child —by whatever means—seems more important than the circumstances by which this seismic event occurs. The basal identities of “child” and “parent” are so profound that the details of creation often recede into the background. Recently, I was struck by an interview with a reformed skinhead, who said that the birth of his child jolted him into “question[ing] my identity, my community, my purpose.” He began to see himself as “having someone to love rather than someone to hate.” There’s little doubt that this same child will struggle to figure out how the father’s complicated past informs his or her own identity. Most new parents don’t experience such a vertiginous challenge to their sense of self as this quondam hate group member. Yet both parents and children—separately, and in relation to each other—inevitably confront the hardest questions of how kinship influences selfhood. There’s no way around it.